In this guide we’ll take a look at the best metal detectors for the UK market. This Garrett AT Pro Metal Detector is suitable for use in all terrains, including beaches and shallow water being waterproof and fully functioning at up to 10 feet. It is also powerful enough to detect gold. 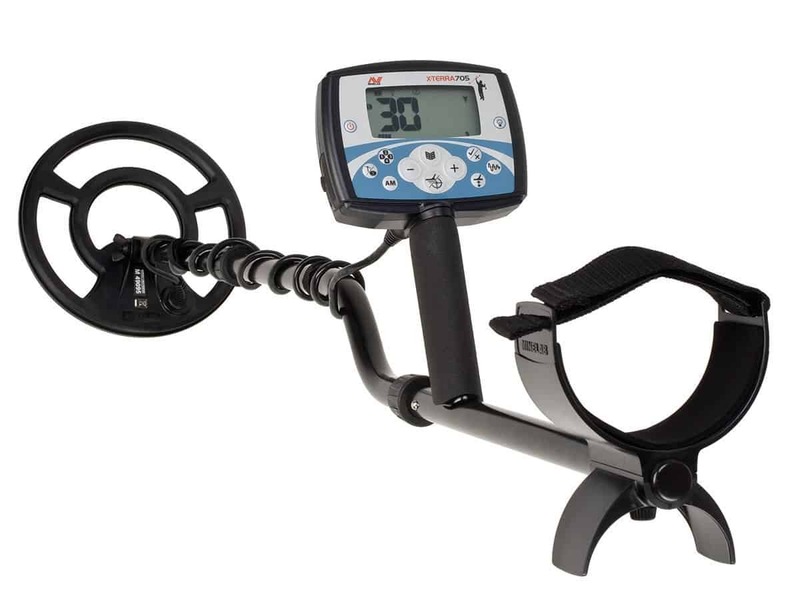 This metal detector features an AT Pro display and a Digital Target ID that goes from 0 to 99. The higher the number the more likely it is that an object is worth digging up. The machine has a standard mode for beginners and a pro mode for once you become more experienced. There is also an iron auto mode which is useful when working in areas with a lot of iron because it helps discriminate between rubbish iron and good targets. This is the best metal detector for the money and includes headphones, a coil cover, a find pouch, a baseball cap, a manual and an instructional DVD so you will have everything you need to get started. The technology and features in this machine mean it is a great purchase if you are serious about metal detecting and want to search for gold! In my opinion this is the best metal detector for the UK market. This X-Terra 705 Universal Gold Pack Metal Detector is the most popular entry level gold nugget detector on the market and is designed to filter through even highly-mineralized soil. This is a serious piece of kit and it will take some time to learn how to use the product. If you have a friend with some experience, then enlist their help or join one of the many metal detecting clubs in the UK. It is worth the effort because, once you have mastered it, this is an excellent machine that will soon have you making finds. This detector comes with VFLEX technology for more accurate detecting. You can change the frequency easily by changing coils. It can be used with low, mid and high frequency coils and all 7 X-TERRA accessory coils are compatible. It comes with an 18.75 kHz Double-D Elliptical coil. It also has automatic ground balance with beach and tracking settings and a manual ground balance range of between 1 and 90. The iron mask discrimination means you can avoid rubbish such as iron nails. It also has a pin point function to help you locate targets more precisely. This detector comes with built in speakers and can also be used with headphones. It takes 4x AA batteries which are included. This is another fine example of the best metal detector for the UK market. It is suitable for the beginner or more experienced detectorist and it is a great entry level machine. This Garrett EuroACE Metal Detector is simple to set up and use meaning you can started with your new hobby with the minimum of research and fuss. The machine is light and strong and comes with a rain cover, coil cover and headphones. If you are looking for a great entry level tool this is one of the best metal detectors for the UK market. This detector comes with a powerful, large 28 x 22 cm PROformance Double-D searchcoil. The machine features enhanced iron resolution and the 8.25 kHz frequency offers the ability to detect small targets. This unit has been specifically designed for use in European conditions. This is a brilliant, reasonably priced detector for the beginner. It is easy to use and offers great performance. A great choice if you are just getting into detecting and don’t want to splurge on the higher end machines until you are sure it’s the hobby for you. This Garrett Ace 250 Metal Detector has all the features a beginner will need and comes with the new PROformance Rhino 6.5″ x 9″ coil. It has an LCD graphic screen, 8 sensitivity settings and 5 pre-set modes, making it easy to use for the beginner. It also features full range notch discrimination for greater accuracy and a pinpoint feature that makes it easier to exactly locate finds. This item requires 4x AA batteries which are included. This detector is suitable for use in a range of conditions, including land, dry sand and wet sand, with a little adjustment of the settings. This is one of the best metal detector models available for the beginner that offers all the features required to make a successful start to your hobby. This DR.ÖTEK Lightweight Metal Detector is a great introduction to metal detecting. It is waterproof down to 10 metres allowing you to find lost treasures underwater. It features 360-degree detection and has an LED light and alarm to alert you of potential finds and it can find items buried up to 4cm deep. You can use this pinpointer on its own, or with a standard metal detector to help locate finds more accurately. This detector is simple to set up and use as you simply insert the battery and are ready to start. You can adjust the coil to discriminate or exclude certain types of metal, thus stopping you from wasting time digging up old nails. This unit is powered with a 1x 9-volt battery which is included. This is a great economical introduction to metal detecting for adults and children (with supervision) alike. It is also a useful additional tool to have in your kit alongside one of the above detectors. Metal detectors have come a long way in recent years and have improved sensitivity and discrimination. With all the new features it is worth taking some time to find out about the latest developments to find the best metal detector for the UK market. Different detectors will detect different things. The more expensive units are suitable for searching for gold nuggets as well as coins and jewellery. The entry-level machines are built for all-purpose detecting – meaning coins, jewellery, and relics. If you want to search for gold nuggets or flakes you will need one of the first two items in this guide or something similar. However, if you are not planning on prospecting for gold then an all-purpose entry level machine is all you need to get started. Most detectors also determine how much iron an item contains since items with high iron content are more likely to be nails than gold nuggets or ancient coins. The best metal detectors are also able to determine how well the items conduct electrical current and this allows them to tell the difference between coins and foil. Obviously, your choice will depend on both how seriously you are taking metal detecting and your available budget. The more expensive detectors have more features to enable you to find more stuff, but they may be too costly for someone who is not sure how much they will use the machine. A simpler machine may be more suitable if you just want to occasionally indulge in this fun hobby. Should I buy headphones to use with my metal detector? Headphones are not totally necessarily as detectors have built in speakers. However, using headphones can help you to hear the different tones and improve your ability to notice a significant target. You also won’t annoy others with the beeping which can be a consideration in busy areas such as beaches. You can buy headphones from as little as £12, however, you might want to spend a little more on wireless headphones which can be purchased for around £40. Should I buy a standalone pin pointer to use with my detector? Many metal detectors have a built-in pin pointer function. You can switch the unit to pinpoint mode so that you can locate the exact location of the item. However, if yours doesn’t have this feature you might want to consider buying a separate one. The pin pointer is a hand-held metal detector which you can use to locate the exact location of the find, for example putting it into a hole to get a more accurate reading. This saves you time and effort as you only dig in that precise location. Where and how can I use my metal detector? You should always have permission form the landowner before using your metal detector. You should also be careful not to damage archaeological sites. It is recommended that you acquire public liability insurance before you begin detecting. What should I do if I find something old or valuable? In the UK we have an excellent system to records the items found by anyone so that they can be enjoyed by the general public. It’s called the Portable Antiquities Scheme and is run by the British Museum. A local finds liaison officer records the items, and then the details are put online at www.finds.org for everyone to study and enjoy. Find out more about this scheme here: https://finds.org.uk/getinvolved.